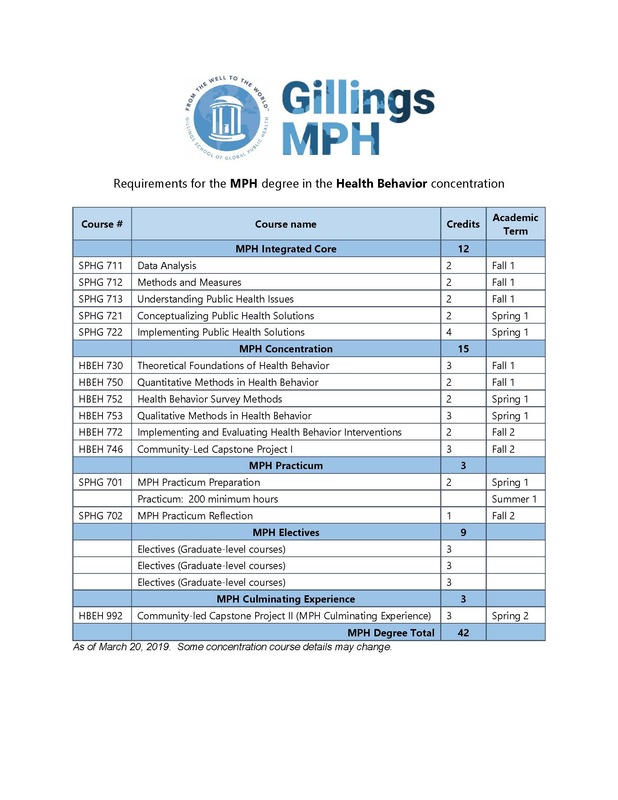 The Gillings School's Health Behavior concentration prepares students for leadership positions in public health practice. You will learn to use social and behavioral science to develop, adapt, implement and evaluate programs and policies that promote health, prevent disease and injury, foster social justice and reduce health inequities at all levels of the social ecological framework – from the individual to organizations; from communities to macro-structures and policies. In the health behavior concentration, master's students gain practical, career-relevant, on-the-ground experience through a mentored summer practicum and a capstone group project working with a local organization. Identify health behavior and social science theories, integrate constructs across levels of a social ecological framework and apply conceptual models to public health practice. Evaluate critically the strengths and weaknesses of quantitative research findings and their relevance to health behavior practice. Develop qualitative data collection and analysis skills for health behavior practice. Identify, adapt and develop instruments and methods to accurately assess health behavior programs. Develop, adapt and evaluate health behavior programs and policies and scale them up using implementation science. Engage with communities using participatory strategies and principles of effective partnerships to plan, implement, evaluate and disseminate health behavior programs.